Astitva - Search for an Identity: New developments in South China Sea - Who will talk first? 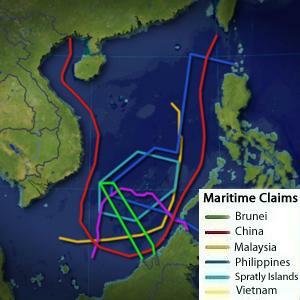 New developments in South China Sea - Who will talk first? Being in a status of big and powerful league of countries can be turn out a liability. Who understands this better than that of China? The growth started on 1970’s took her to rapid industrialization and economic progress; people suddenly started saying about the rise of China and her economic as well as military might. Books stores where filled with the analysis reports regarding to the events in China. Now-a-days people even started thinking about a bipolar world where one pole is fixed on Beijing. It is true that, today China has the potential to exert its influence not only on its immediate neighborhood, but also on South Asia, South East Asia, Africa and as far away as South America; but it will take some more decades to acquire an influence close to that of US. 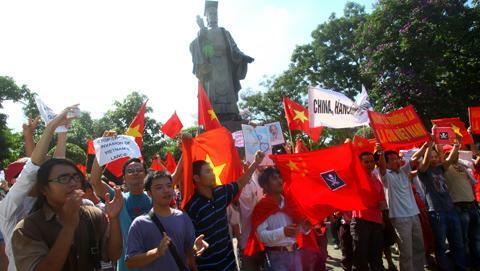 That too will happen if it’s able to solve the problems in her immediate neighborhood – South China Sea. It’s quite natural that, a giant neighbour in the vicinity can make others uncomfortable. It will be sorer if the relation carries bitter memories from the past and the conflicts of present. In such a situation if someone is demanding something extraordinary then it will only make the problem worse. This is what happened when China added the entire South China Sea to its core interest list. Panic suddenly spread across the capitals of South Chinese littoral states. The problems – fishing boat incident - with Japan in Senkaku/Diaoyu and with Vietnam and the Philippines in Paracels and the Spratlys group only added fuels to it. Now to resolve these issues, the interested parties have to sit around the table and talk. Here comes the problem, China may be ready to speak with the nations individually in which case it holds enormous bargaining power not only in size but also in economic and military might but the small nations will not be agreeable to this idea as they know their weakness. They may be more comfortable with to talk with China in a multilateral framework like ASEAN, when as a combined group they have considerable power. But China will not be comfortable with the idea, as it will reduce its bargaining power and there is a possibility to bring the US to the equations. So other than rhetoric and some meetings here and there any speedy resolution is not in the horizon. ﻿ But who will be the beneficiary in this situation? Certainly it will not be China. The open problem involving her in the neighborhood will restrict her freedom in playing a global role. Same thing will happen with India too. The ongoing problems with Pakistan will slowdown her rise to from South Asian framework to that of an Asian framework and them to a global framework. The beneficiary will be US, as it will get an opportunity to come back to South East Asia that too an invitation!!! Already US plans to create a base in Australia is in full swing. A place away from the range of Chinese anti-ship missiles as the existing bases like Guam is close to Chinese missile ranges. Each aggressive move by China will be watched all over the world, these actions will not help her in creating a smooth international profile. So it will be better for China to sit with South East Asian nations and try to solve the problems peacefully under UN conventions on High Seas or according to any regional frameworks. They can also extract a guarantee from the littoral states for a safe passage of all supplies to China through Malacca Straits on all circumstances. Under any circumstances sea lanes should be open to international commercial navigation.